T his past week I’ve been making a few more decisions for my kitchen! So fun! After the decision for how to alter the layout, the choices I’ve had to make were: the counters, the tile, the range hood, the sink and the faucet and the cabinet color. I’m glad I’m keeping the flooring, my appliances and most of my cabinets or my head would explode with options. So with a fairly straightforward update to a kitchen, this process should be pretty simple, right? Not really. Even though it isn’t the most extensive redo ever, there are still decisions to be made! Let’s start talking about some of the elements that are going into this kitchen makeover! Today we’ll talk about the sink and faucet! I thought it would be pretty easy as I had searched high and low for sinks and faucets when I did my last kitchen, so I had a pretty good idea of what I liked. But, this is a totally different house. So basically I had to go through the same thought and research as I did before to come up with the right choices for this house. After I weighed all of my options, some of the things I chose before can translate over to this one, but in a new fresh way. 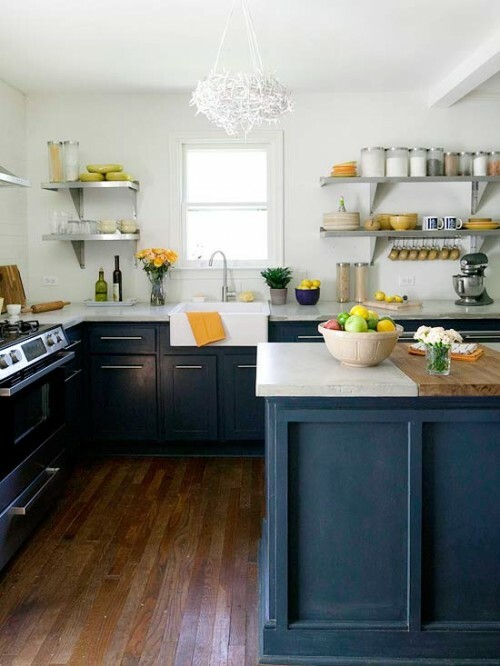 I still like what I like, but it definitely will NOT look like the same kitchen, even if there are a few similarities. This kitchen will have its own personality. This is not a house we want to invest a lot in, so we are being careful to choose quality (for ourselves) within reason (as to not over-invest). Plus we are working with the appliances we have (even though I would die to have a new Viking range!) so there are less decisions to make this time and less options for what we can do. Those are factors you work with when you are on a budget, but it is a fun challenge I enjoy! So on to the faucet and sink decision! I love a white sink. Not that I don’t love a copper or beautiful quality stainless sink too, but somehow a large undermount white cast iron porcelain finish sink just feels like my kitchen to me. So, that was my starting point. I had a gorgeous deep fireclay sink at my old house and while it was beautiful, I just didn’t love the finish as much as the cast iron so I’m going back to cast iron (with a porcelain finish). I also like single basin sinks. Not sure why, I guess I like how wide they are! I get flustered with tiny sinks. While it is handy to have a little side and a big side if you want to separate out a garbage disposal or use the other side for another purpose, I’m just fine with having a single bowl. It just feels simple to me and I guess I like simple. Kind of funny story, when we moved in this house there was no garbage disposal. I thought that would be the FIRST thing I’d install. But nope, we still don’t have one three and a half years later. And I’m used to it now. No biggie. We may or may not end up with one, we’ll see. I like exposed apron front sinks. 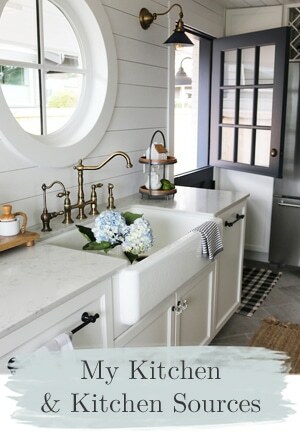 After looking at all the sink options available, I decided I wanted an exposed apron front sink but not one of the larger farmhouse sink styles. I didn’t want a bulky looking sink, and I didn’t want the added expense of getting a new sink cabinet to hold a farmhouse style sink. But (oh happy day!) I found one that is a nice exposed apron front, still 9 inches deep inside, but fits in a traditional cabinet (yay, less cost for me!). I think it looks modern but with a nod to the traditional farmhouse style. You can see the sink I’m considering, above. I love cute faucets. I can’t help it. I LOVE LOVE LOVE a bridge faucet and would have chosen one except they used too many holes for my situation (I also have a water filter faucet and it just gets to be too many things lined up behind the sink). They are sure lovely, though! And a nickel finish is so beautiful! I DIE! LOVE! The faucet I chose is almost identical to my old faucet (just a less expensive brand than my Rohl, yay for the budget!) but still a quality faucet (Danze). I’m sure I will love it and am excited to bring a little reminder of my old kitchen to my new one! 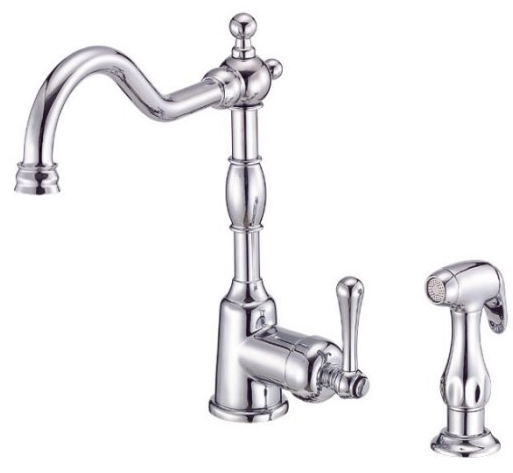 I almost didn’t choose one like my old faucet because I had this crazy notion in my mind that it was too English and fancy for my modest house. Totally was over thinking it. Now I am picturing it as a FUN faucet. Crisis averted. It feels great to have some of the research behind me now and decisions being made! The past couple of weeks have involved moving everything out of work zones, tearing out the things we are going to replace, finalizing budgets and making purchase decisions (both on our flooring project and our kitchen). On the hardwood floor project, we still have to have our carpet torn out (there was a slight delay on working out some details of the project, but we are on track now to move forward) but hopefully within the next week or so that will happen. The flooring has been ordered and should arrive in the next couple of weeks. I’ll be talking about my countertop (nope, it isn’t wood this time, even though I love wood counters, and even though I love and pin a lot of marble countertops, it won’t be marble either) and the range hood in the next week, so stay tuned! Hope you all had a great holiday and are enjoying some nice summer weather! We finally got some sun, hooray! I’ve pinned that same Rohl faucet – love! But it ranges in cost from $1500-1800, really! I don’t know how often I see a photo of something I love, search the internet for hours to find it only to discover it is waaayyy out of my budget. The challenge is to find the look for less. Love following your remodel. All this kitchen talk and your gorgeous idea photos are killing me! We are about to do a bathroom, and now you’ve got me dreaming of a kitchen! I will try to squash that urge and just enjoy yours. I’m trying, I’m trying, I’m trying……. Ah! Picking out all of the little details in your kitchen is the best part! Cherish this time! Take lots of before pics! And enjoy imagining how it will all look; it’s so refreshing once it’s finally done.. But once it is, looking at each detail, and remembering how you got there is also quite rewarding :) Can’t wait to see your finished kitchen! I’m sure you’ve got it all figured out, Melissa. I am looking forward to see the finished product, too! Delightful site and nice post. Got a question for you. Does that beautiful Danze Faucet come in a disc version? If I’m not mistaken, the one in the image you displayed is a cartridge model. I prefer disc models as they require less maintenance. I tried to get info from Danze’s site but it’s down. I love your choices so far. That sink is gorgeous! It took me a year to finally decide on the faucet the second time around. The first one was an easy choice because I had a picture of exactly what I wanted, but not the second time. I had no idea and man at the choices at there!! Glory! It will certainly make your head spin. Can’t wait to see what else you dream up! 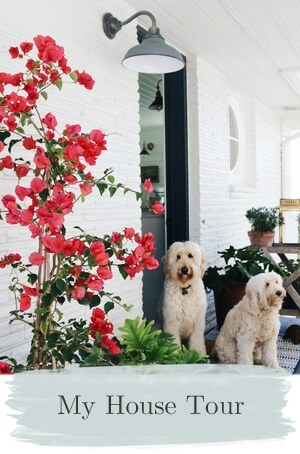 LOVE those all white kitchens … wonder how we’d keep them that way! 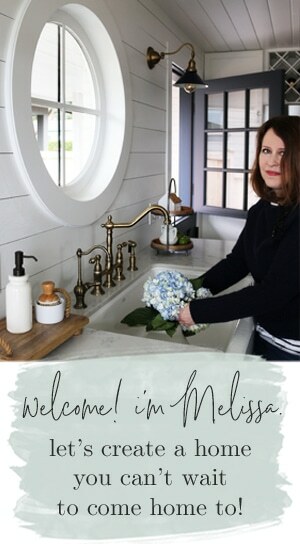 All I was thinking as I read this, Melissa, is that I hope that gal gets her apron front sink! I can wander off now, a happy reader. It all sounds very exciting and I’ll be checking it to see how everything turns out. 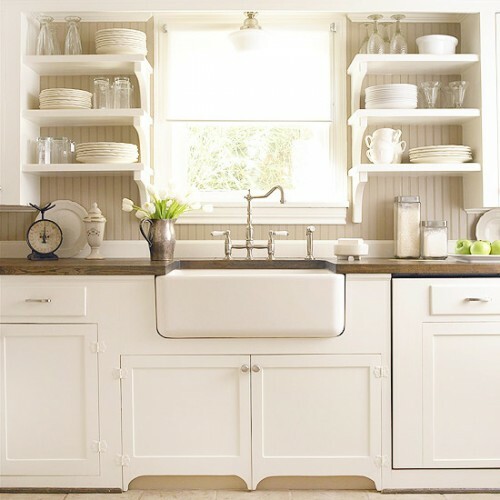 While all white sinks and white subway tiles are classic, they will still look dated in twenty years because of the overall look of the kitchen. This look is a fresh take on kitchens from eighty to one hundred years ago and they are popular because they invoke a warm, comforting feeling from when times were simpler; but have no illusions that this look won’t say “2012” twenty years from now. Just think of classic chintz and the way that it was used in the 1980’s. There is no mistaking a chintz sofa in all of it’s ruffled glory from the 1980’s from the way chintz was originaly used way back when. 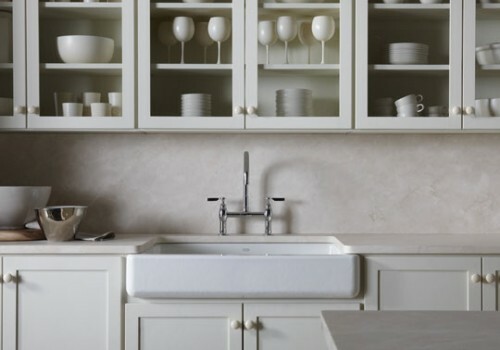 If farmhouse sinks and subway tiles weren’t on trend now, then we would have been seeing them used in the decades from when they were first popular through to today. In our society, every decade has a particular look to it based on trends of the times. No matter what you choose, it will always eventually looked dated. What’s important is to pick what you love based on the trends of the day and how they fit into your lifestyle. Our twenty three yr old kitchen is in need of an overhaul, (anyone else still living with the laminate oak “J” strip cupboards from the late 80’s?) even after we spruced it up too many years ago with a fresh coat of paint, new hardware, an island, new countertops and a new faucet (which leaked and rotted out the laminate countertop, but that’s another story) not to mention that the cupboard doors are starting to fall off; so an overhaul is overdue. I have been following your blog closely and I love your style and the inspiration that you share, but I know that not all looks that I love fit our lifestyle. I’m not OCD enough (and I mean that in the nicest way) to have open shelves or even as many glass fronted cabinets as I would ideally like to have. And as for the porcelain sink, having rented an old 1920’s apartment that had a similar style sink, I know from experience that your dishes and especially china will have a harder time of it. You don’t realize how forgiving a stainless steel sink is until you mindlessly drop a wineglass into a procelain sink full of soapy water only to hear that heartbreaking sound of another wineglass broken! Life’s too short to baby your dirty dishes; or maybe it’s just me being too practical. While you can always use a plastic wash tub in your sink to protect your more fragile dishes and it enables you dump out DH’s coffee mug without a trip to another room that has a sink, it’s one more thing to store. A porcelain sink doesn’t help to make your kitchen more efficient; beautiful yes, practical, not so much. But that just my two cents worth… Can’t wait to see how your kitchen turns out though, and more importantly, how the trade offs of form over function works for you and your family. That is how ALL style is, it comes and goes! You can go with the latest trends, or you can freshen up an old classic. I prefer to stick to freshened up classics. I don’t design my house for how it will look in 20 years, I want to love living in it today. I’m sure our homes will all look dated in 20 years, it is just the nature of our crazy society’s obsession with trends. Every kitchen needs updating as it gets older though, appliances break down and materials get dated, that is to be expected. I’ll gladly retile in 20 years, if I’m still in this house! Life is too short to forgo what you love just in case you might not like it in 20 years. I’ve loved this same basic look (and the same sinks!) for 25 years so I think I’m safe, and I can update or alter as time goes on if I find the need. 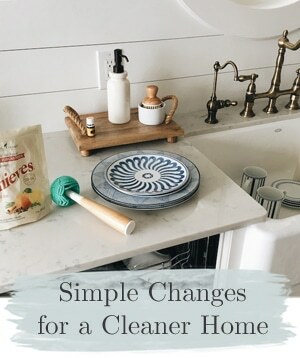 This is such a simple kitchen makeover with a little paint and tile and a new sink, it isn’t like I’m putting in something super crazy or trendy or adding on some horrific 1970s style addition to my home (which is what I had to UNDO in my old house!) ! 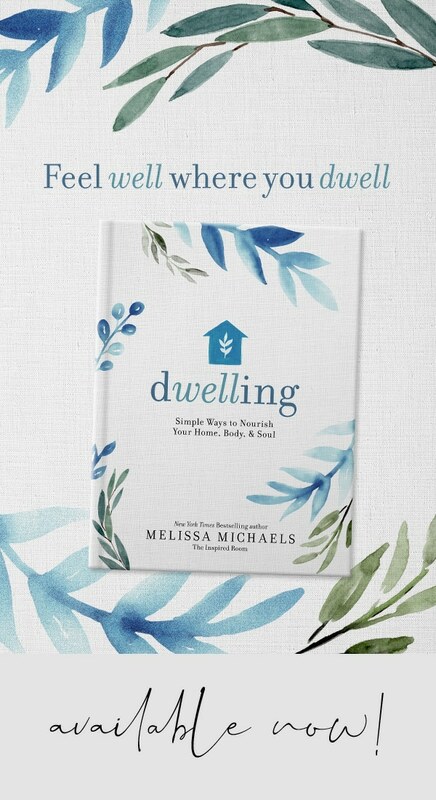 Melissa, I have been a lurker (though a subscriber) to you blog for quite some time. I love your style. I actually found your blog from a link to The Yellow Cape Cod. My husband and I are about to build our home and I am so inspired from all the design blogs that I have read it is amazing!!! 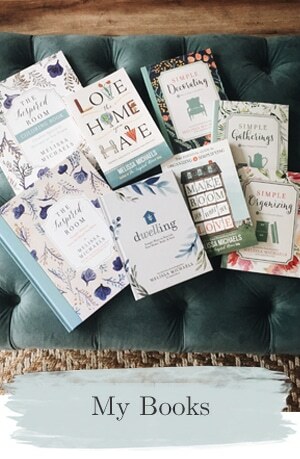 Thank you for sharing your home with me, it is beautiful and I can’t wait to see the results. Also, I love your blogging style, you always keep us guessing. I actually just started my own blog to follow the progress of our home as it goes from concept to construction to completion. Thank you Denise!! Congratulations on the new blog and building your home!!! So exciting! Oops, forgot this:I DO like that you’re excited about the smaller fronted farm sink. Stepping out of the crowd! Go Melissa! I am so loving your choices, Melissa. I’ve been dreaming of a new faucet for our kitchen, too. There are several large projects higher on our list that we need to address first. Love the sink choice – the exposed apron really adds some character. The research is the toughest / tedious part – with that behind you…you go girl! How fun! Love reading your thoughtful process of selecting your faucet, sink, and more. When we built our home we had a large sink with the small sink to the side with the garbage disposal. Loved it!!! Since I’ve had lots of other sinks including the double we have now that I DO NOT LIKE. The sink is more important to me than the faucet. It sounds funny….but I think maybe you understand. BTW…I love the first photo with the open shelves. A hint of what’s to come? I love the direction you’re headed and believe, like you, that white subway tiles and farm sinks have already proven their staying power. Besides, you have to choose what you love, you’ve told us that many times. I can’t wait to hear each decision and see the end result. Oh boy, so glad that I am following along at just this time. Need to make kitchen decisions on a new home we are building and I love what you share. I just tried to find that model of faucet and did not see in on their site….any hints of it’s name? LOVE – LOVE – LOVE your style and blog! Thanks Susan, I keep trying to go to their site and it seems to be down. If I can find the name of it I’ll let you know! http://jenrick1.wordpress.com/2012/06/25/good-night-moon/ and look forward to more of your helpful ideas. I love this post! It is underestimated sometimes how much personality a sink and faucet adds to a kitchen. My mother-in-law bought her two sinks (one for the kitchen island for easy food remnants cleanup, and one for regular use) in France many years ago while traveling. 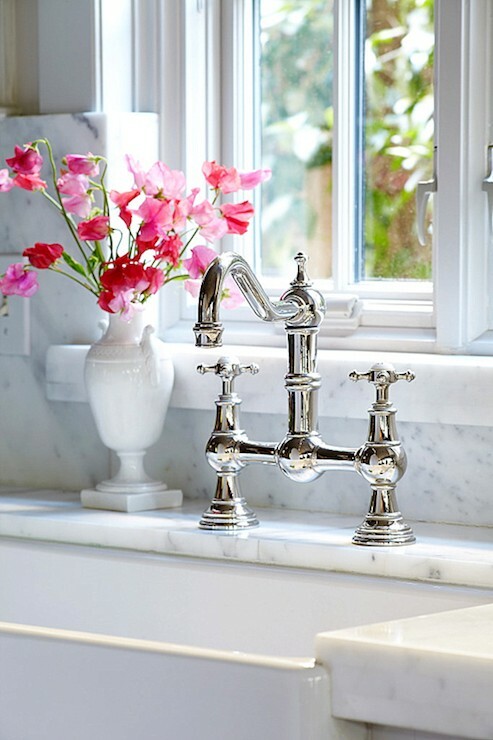 These sinks and faucets have only gotten more beautiful with age, and are one of the focal points of her kitchen because they are so authentic! Can’t wait to read more about this! Happy Friday! You are going to have a fantastic kitchen. I was wondering the maker of the top-mount sink. Would you share? I love and am completely amazed at how you make it so easy to click click click to other sites. I enter your blog and slip into a design portal. Do you have a degree in blogging?! No wonder BH&G likes you so much! Hey Melissa, Your blog is one of the blogs I check everday-so I have been a fan for a long time. Just imagine my surprise when I clicked on today and there I was!! Can’t believe it! Thanks so much for featuring me on your Room Tours. We are currently working on other parts of the house- but then again when aren’t we?? So thanks again, and keep up the great work you do on your blog. How exciting! I love all of the fixtures you have picked. My hubby and I are totally in love with that subtle farmhouse feel, like your sink and faucet choices. They feel cozy and homey and just like a kitchen should! I recently got a new faucet and it (kinda) feels like my kitchen has had a mini-makeover. Sometimes it’s those little things that make a big difference! We also went to Lowes yesterday to pick out flooring for the whole first floor. Let me just say I am ready to tear up that old flooring with my teeth if that’s what it takes! Just found your wonderful blog!! Good luck with your project – it will be so worth it! Hi–can you please list what apron sink you used which fits in a standard cabinet? It’s called White Haven by Kohler. I just “stumbled” upon your site. I love it! I recently got a new faucet and it was a fantastic inexpensive update to my otherwise drab kithcen! No I have to figure out how to follow your blog! Great site! Hello! Did you get the polished nickel or chrome for your Danze faucet? Hi Misty! I got the chrome. I love polished nickel, but it was more expensive and the cooler toned chrome seemed to work well with the rest of my gray and whites!